LEE, William James Austin (RAF) September 24, 1923 - July 9, 2016 At peace at last and gone to be with his beautiful Kathleen. The family of the late William Lee sadly announces his passing at St. Joseph's Continuing Care in Guelph, ON. Predeceased by his beloved wife, Kathleen Dorothy Lee. Loving father of Maureen Baum and Austin Lee and his wife Joyce of Guelph, ON. Proud Poppa to Dr. Julia Kathleen Baum of Victoria, B.C. and Brant Baum and his partner Beth Hall of Hobart, Tasmania, Danielle Kathleen Lee, Victoria Lynnette Lee and Nathaniel Austin James Lee all of Guelph, ON. Loving Great-Poppa to Harrison Davies of Victoria, B.C. 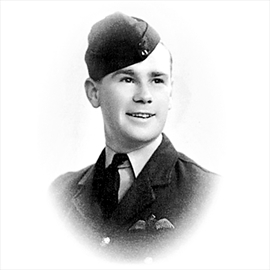 Proud pilot with the RAF during the Second World War and founding member of the ANAF in Guelph, ON. Bill and Kathleen settled in Guelph, ON in 1953 after emigrating from Belfast, N. Ireland. "He did it his way!" Cremation has taken place. A private graveside service will be held at Woodlawn Memorial Park Cemetery. A Celebration of Life will be held at the ANAF Club, 32 Gordon St, Guelph N1H 4H1 from 1 p.m. to 3 p.m. on Friday, August 12, 2016. In lieu of flowers, donations to the Guelph Humane Society in honour of their beloved dog Magnet, would be appreciated. Arrangements entrusted to the GILCHRIST CHAPEL - McIntyre & Wilkie Funeral Home, One Delhi Street, Guelph, (519-824-0031). We invite you to leave your condolences and donations online at www.gilchristchapel.com.